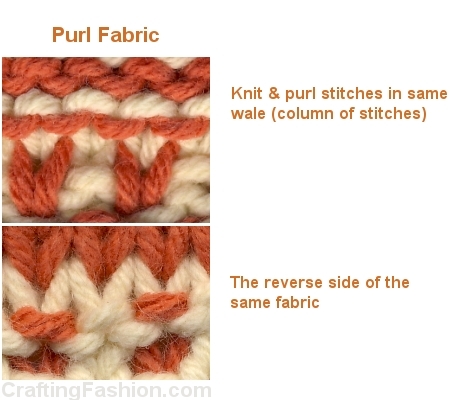 I've added short definitions of purl and interlock to my Knit Fabric Glossary. If you'd like to read more about these fabrics, read on! There is a very popular sewing book from a major craft book publisher that states that a purl fabric is made of all purl stitches. I think this is a very poor definition of a purl fabric! If a hand knitter were to make purl stitches across one row; turn the fabric; make purl stitches across the next row; turn the fabric and repeat several times; yes, a purl fabric would be the result. If, however, the hand knitter were to make knit stitches across one row; turn the fabric; make knit stitches across the next row; turn the fabric and repeat several times; the result would still be a purl fabric. Hand knitters call this the garter stitch. Since a purl stitch is just the back side of a knit stitch, no matter which way the knitter did it, the resulting fabric would be the same. 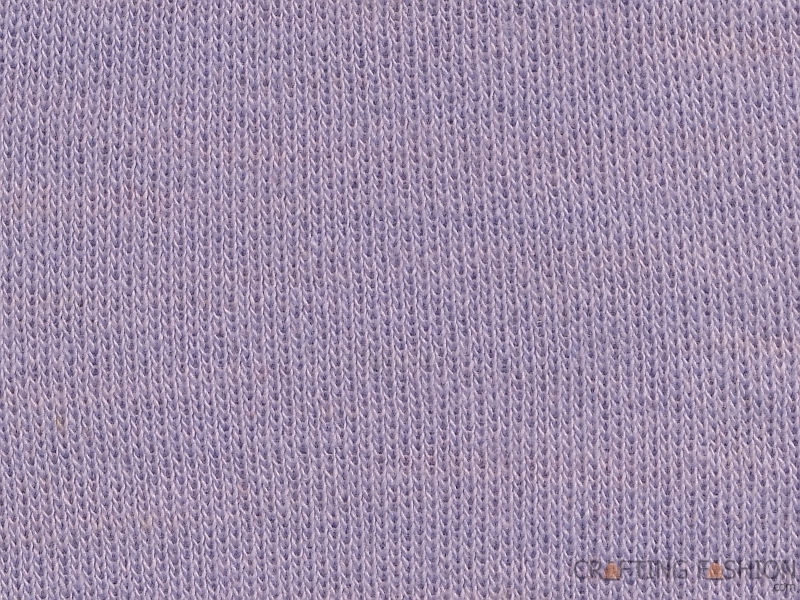 The artisan- or commercially-produced, machine-made purl fabric is not made by turning the fabric. The artisan uses a special "transfer carriage". If the fabric is made industrially, a knitting machine with special needles is used. As in the example above, a purl fabric can be more than that simple garter stitch. As long as both knit and purl stitches are in the same column of stitches, it's a purl fabric. These fabrics can have gorgeous and complex textures involving, tuck loops, slip stitches and cables. Balanced purl fabrics can be very easy to cut and sew because they don't roll at the edges. 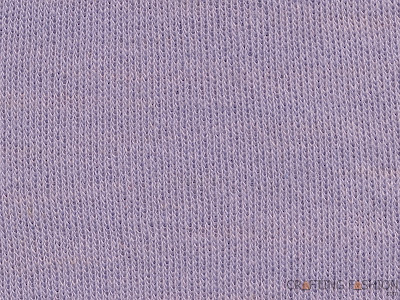 Below is an interlock knit fabric. Funny thing -- even if you click to see the enlarged version, it still looks like a jersey in the picture. If you had the sample in your hand, however, you'd see that unlike the jersey, the reverse side of basic interlock fabric looks the same as the front side of the interlock fabric. An interlock knit is not the same as a basic double knit rib fabric. Once you stretched the fabric, you'd see that interlock does not divide into neat ribs. That is, there are no columns of purl stitches visible between the wales of knit stitches as in a double knit rib fabric. The interlock has been produced differently than the double knit rib fabric by using a different knitting sequence. The interlock fabric has lots of interesting features. It has greater stability than a basic double knit rib fabric, and the interlock's surface is smoother. This makes it an excellent vehicle for printing or discharge paste projects. It's a more expensive fabric than a double knit rib fabric, because it takes longer to make when it's produced industrially and much longer to make on a hand knitting machine! Can the interlock fabric even be made on a home knitting machine? If so, I'd love to learn more. Yes, it can! It's beyond the scope of this blog but a good topic for my "Knitting in the Fastlane" blog. I'll post "the recipe" later this week, then post the link in another reply to your comment. What are some examples of different garments that use interlock fabric? :) Need the answer NB, for a project. Interlock refers to the structure of the fabric. T-shirts, dresses, or winter scarves, for instance, could all be interlock. It all depends on the weight of the interlock fabric and the fiber.